The Cape Dutch architecture style was developed around the 1800’s in the new colony of Cape Town, South Africa. The Cape Dutch style had influences from medieval Holland and Germany, French Huguenots, and Indonesia. These farmhouses had thatch roofs and white washed walls with a simple symmetrical façade, sensible floor plan, added wings in a U, T, or H shape, raised stoop, and a gable. The early Cape Dutch style houses were built very symmetrically— the central door was the focal point, and on either side, two half-windows were equally spaced with two or four full-width windows. The kitchens had open fireplaces and a Dutch oven fitted with iron bars to hold cooking pots. 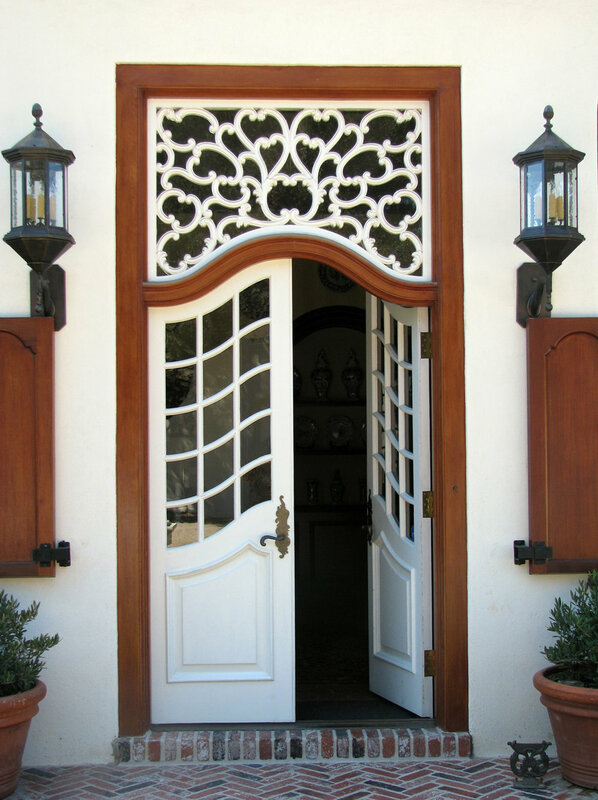 As Cape Town grew, so did the elaborate design of the Cape Dutch style. Homeowners began to add wings onto the ends of their original structures, resulting in a U-plan. The T-plan began to evolve in rural areas, this model had a single wing, with a kitchen at the end attached to the center of the main building. Later, another wing was added at right angels to the T, and parallel to the original building creating the well known, H-plan of Cape Dutch homes. As the architecture changed, so did the materials. The floors began to be made of Robben Island slate, shutters were crafted to protect windows, and stronger wood like ironwood was used in the construction of the homes. Often farms were magnificently placed against mountain backdrops and surrounded by agricultural lands. Cape Town, South Africa was entirely created for agricultural purposes. Produce and cattle were farmed to supply passing ships and the employees living at the Dutch East India’s provisions stop. 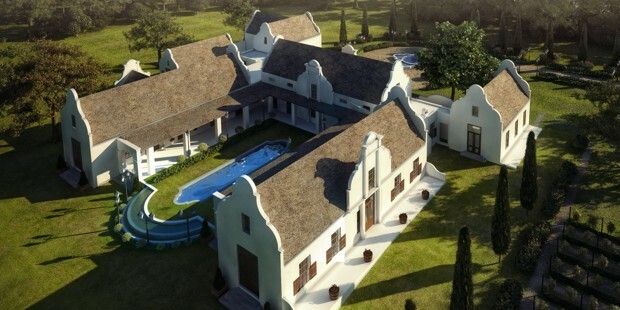 Homes were built for the farmers and merchants, and that is how the Cape Dutch style arose. These homes were built strictly out of necessity, small in size and made of basic materials. Roofs were made up of wild reeds, indigenous wood was used for frames and support beams, while the walls were clay, thick rubble, or burnt brick. Floors were made of lime-mortar from seashells, and due to minimal technology and lack of local materials, floors were often made of compacted peach pits or left as dirt. Larger homes were built as the economy in Cape Town flourished— the small farmhouses were extended in a Northern European longhouse fashion. 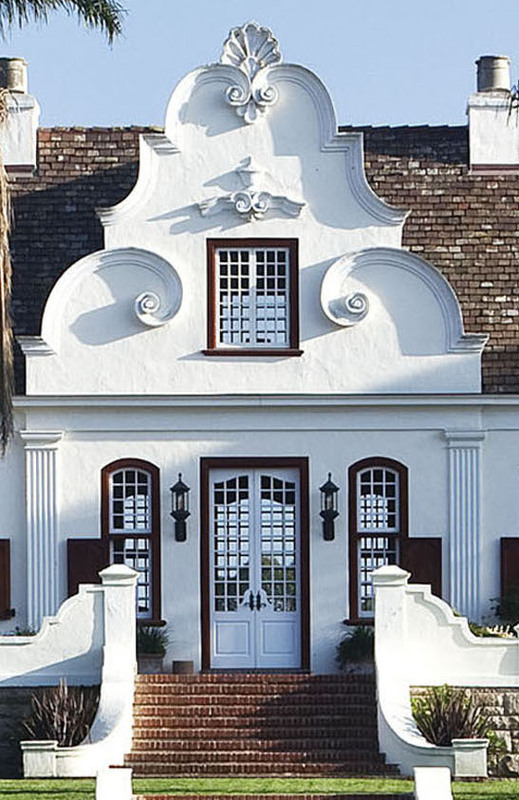 The most distinctive and unique characteristics of Cape Dutch Architecture is the central dormer gable. A Cape Dutch house has its own individualized gable with consistent features including: the date of construction, molded decorations, and a prominent centralized location. Many of these historic gables were created by the Malay craftsmen, as the non-European carvings are evident. The gable represented the financial wealth of the settler, their social status, ownership, and their power over the landscape and social structure. The date of Cape Dutch homes can be identified by the central gable— the more elaborate gables were newer styles. The earlier gables of the late 1600's and early 1700’s were lobed or curvilinear, and later concave or convex shapes. Transitional styles followed, and by the later 1800’s the Neo-classical style. 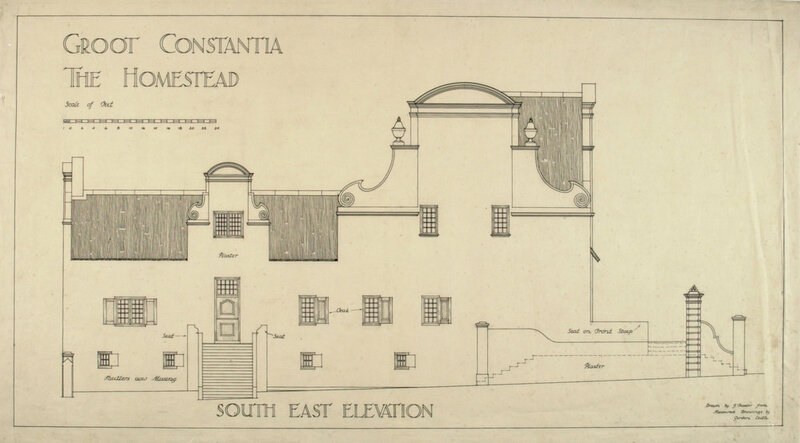 Named for the wine region of Cape Town, South Africa, Constantia arose from the visionary genius of Ambrose Cramer, who designed the pristine estate in 1930. Cramer drew inspiration from the Cape Dutch homes that populated the southernmost tip of the African continent. Santa Barbara and the Cape held appealing similarities in climate, vegetation, and scenery, and Cramer was commissioned to recreate the same plantation style amid the breathtaking terrain of Montecito. Constantia has all the essential features of the Cape Dutch style home: great gables, wide windows with mahogany half-shutters, broad wall surfaces, and high-pitched roofs. Just like the original Cape Town homes with mountain backdrops, Constantia is carefully sited with vistas of the reflecting pond and mountain range to the north, and the expansive views of the Pacific Ocean to the south. The Constantia estate in Montecito was inspired by Groot Constantia, South Africa's oldest wine producing farm and best known wine estate. Groot Constantia evolved from one man's love of wine, where he created the first wine farm in South Africa. Commander Simon van der Stel arrived a the Cape supply station in 1679 with an expertise in viticulture from his vineyards in the Netherlands. Simon van der Stel was granted the land by Hendrik Adriaan van Rheede tot Drakenstein, which he named Constantia. It is thought that the the farm was named after Van Goen's daughter, in thanking him for helping obtain the farm land. Today the estate is owned by the Groot Constantia Trust, which is committed to maintaining and restoring the national monument. It is still a fully operated farm, one of South Africa's most visited tourist attractions, where a wide range of quality estate wines are created and sold.